Making a cake into a log will always be intimidating I think. I got the cake part down and I even know what type of towel to use and how much powdered sugar to put down so the cake doesn’t stick, but for some unknown reason I almost always get a break in my cake in the first roll over. 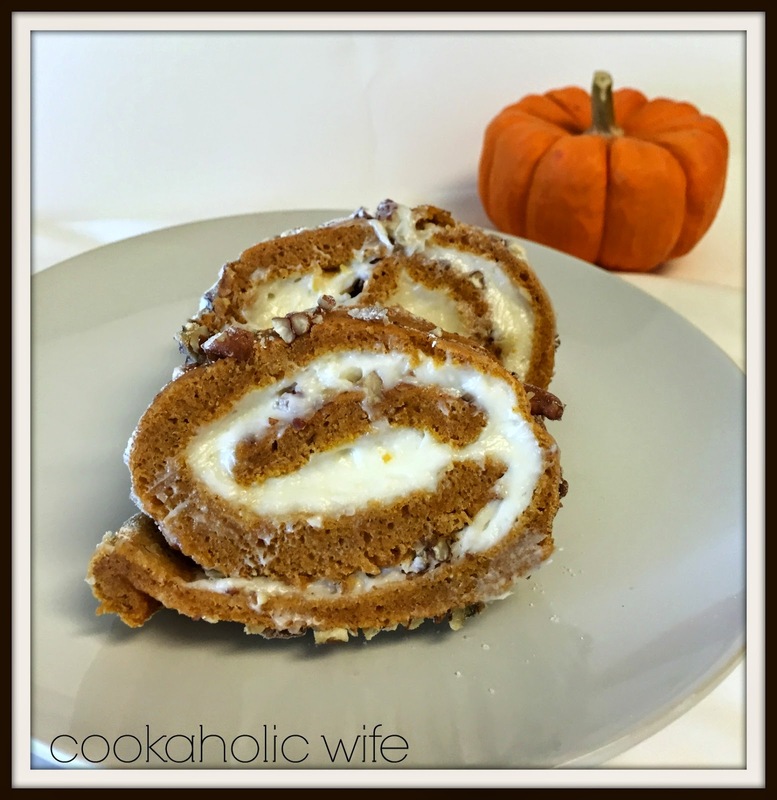 One day I’ll get this right, but until then you’ll just have to enjoy pumpkin roll cake. Terrible fate, huh? 1. Preheat oven to 375. Spray or grease a jelly roll pan (15×10 rimmed baking sheet). Line with parchment paper and spray or grease that. Sprinkle with flour and shake to coat all of the parchment paper. 2. Combine the flour, cinnamon, baking powder, salt and nutmeg together in a small bowl. 3. In the bowl of your stand mixer (or with an electric mixer) beat the eggs on high speed for 5 minutes, then slowly beat in the sugar until the mixture is a pale yellow color. Add in the pumpkin and lemon juice. 4. Add the flour mixture to the mixer a little at a time until fully combined. 5. 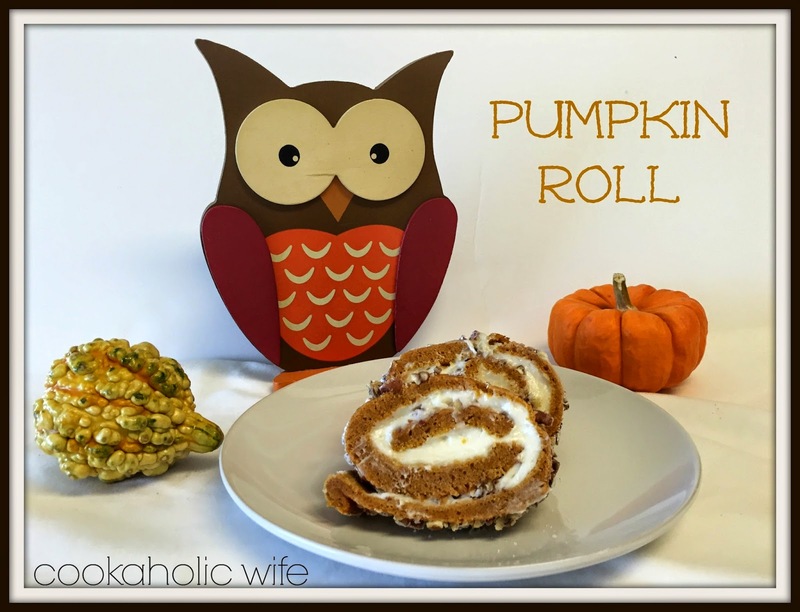 Pour batter onto the prepared jelly roll pan and spread smooth with a spatula. Sprinkle chopped walnuts evenly over the batter. 6. Bake for 15 minutes or until the cake springs back when lightly touched. 7. Dust a large linen or cotton kitchen towel with powdered sugar. Loosen the cake edges with a knife and quickly invert over the towel. Peel off the parchment paper and quickly roll the cake up in the towel starting with the short end. Allow to cool for at least 1 hour. 8. Beat the cream cheese and butter together on medium speed. Once combined, slowly add in the powdered sugar and vanilla. If frosting is too sweet at a pinch of salt. 9. Carefully unroll the cake and spread the cream cheese frosting almost to the edges of the cake. Roll up again and chill until ready to serve. If the ends of your cake aren’t pretty, slice off a thin layer with a serrated knife before serving.